Last month we shared with you some basics about U.S. copyright law. Today we’re continuing to answer some of your frequently asked copyright questions in this month’s edition of Copyright Conundrums. We’re going over some more basics to help you better understand just how copyright works. We’re taking time this week to answer some of the questions we get asked most frequently. Copyright questions are certainly at the top of the list. Today we tackle the basics of Fair Use. Fair Use is an exception to the rights of copyright owners and allows the public to make limited uses of copyrighted work. Fair use is a balancing test – does the overall use after evaluating and applying all four factors lean in favor of or against fair use? As you can imagine, this is very fact-specific and there is no one right answer. The bottom line: think of fair use as a defense – it is always better to obtain permission or have a license to use copyrighted work (or use a work in the public domain); if not, then we may rely on fair use after balancing the four factors above. The first “copy” was created using static electricity by inventor Chester Carlson on October 22, 1938. 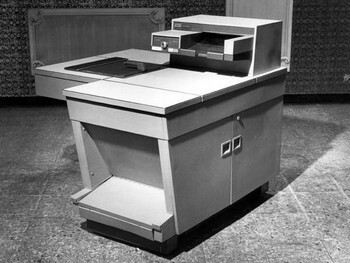 Decades later in 1959, the Xerox machine came on the market and changed how we do business forever. Read more at NPR.com. Photocopiers have long been found in libraries, allowing library patrons to photocopy pages from books. Librarians everywhere can be found shaking their heads in disbelief as patrons proceed to photocopy not just pages, but chapters from a book. So what’s the big deal? Copyright compliance. Somewhere a misconception began that it is “ok” to copy no more than 10% of any book. Actually, the U.S. copyright law makes no mention of this. The truth is, it is a violation of copyright law to reproduce any part of a published work to which copyright still exists. However, their may be exceptions under the doctrine of Fair Use, found in section 107 of the U.S. copyright law, which lists “various purposes for which the reproduction of a particular work may be considered fair,” including teaching, scholarship, and research. Four factors are given to determine whether a use is fair. More on this in a later blog post – stay tuned! Until then, we urge our users to ask our friendly library staff for permission when photocopying library books. We will most likely say go ahead, but please don’t let us see you photocopying an entire book! That most certainly would not be considered fair use.